Cassiopeia A, one of the brightest radio sources in the Universe, it’s a supernova remnant that is possible to study with Radio2Space SPIDER radio telescopes. As you can see in the graph below, Cassiopea A radio emission at 1420 MHz is second only to the Sun and it has a flux of 2400 Jansky at 1420 MHz: this way it’s possible to detect and study Cassiopea A also with the compact antennas of the SPIDER radio telescopes, thanks to the high sensitivity of the H142-One receiver and the advanced features of the RadioUniversePRO software. 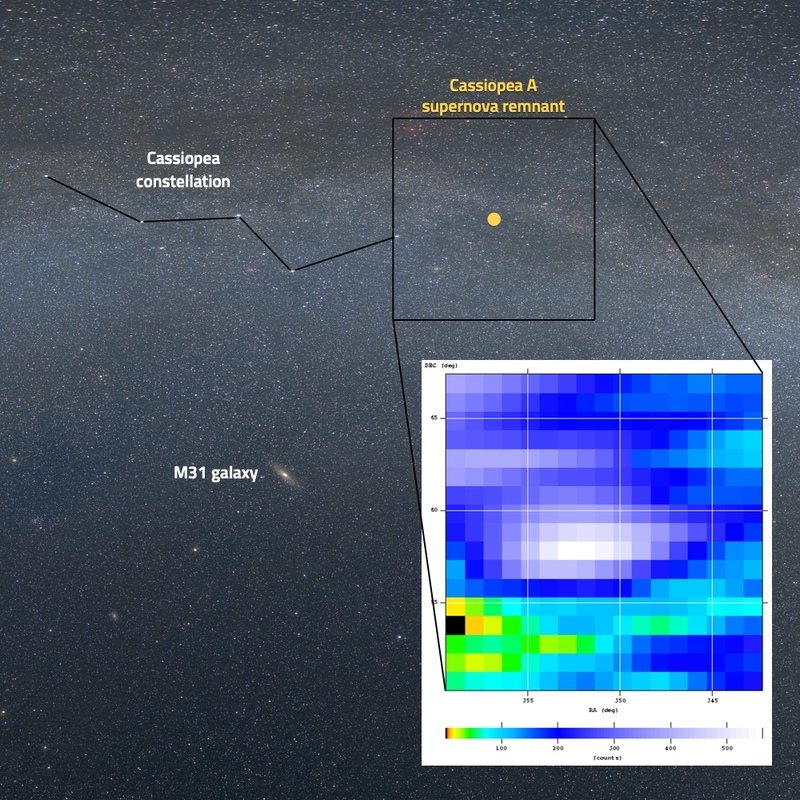 In this article I will write how we detected Cassiopea A and how I used the SPIDER 300A advanced radio telescope to detect Cassiopea A: starting with antenna alignment, we detected interferences and performed RFI mitigation, then we recorded Cassiopea A transists, spectra and radio maps. 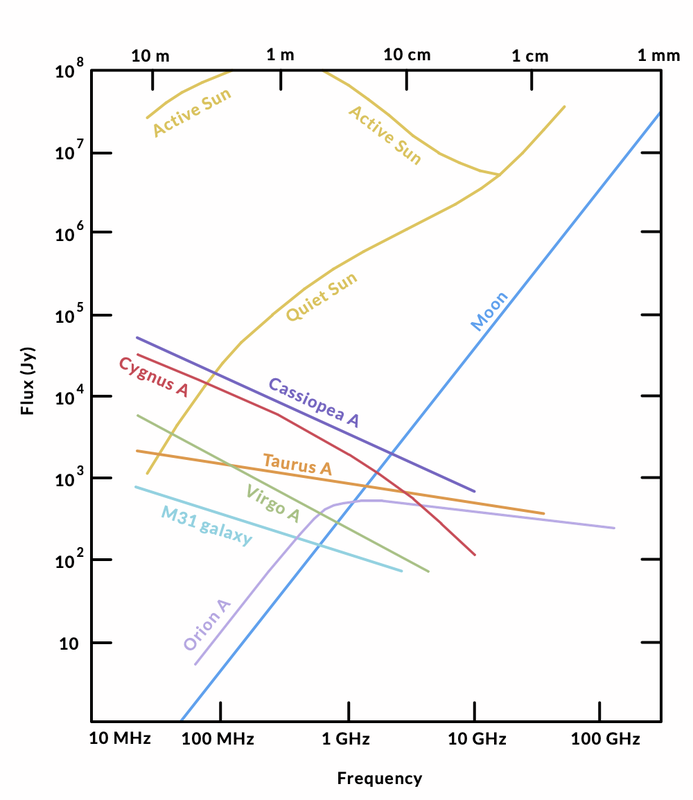 Cassiopeia A (purple line) is the second radio sources in the Universe, second only to the Sun! Cassiopea A is a very interesting object to study since, in visible frequencies, it’s extremely weak since it’s hidden behind the interstellar dust of the Milky Way plane which absorbs the visible radiation. That’s why Cassiopeia A (also called Cas A) was identified in radio wavelengths only in 1947 (Cassiopea A was one of the first radio sources to be identified) and the optical counterpart was identified in 1950. 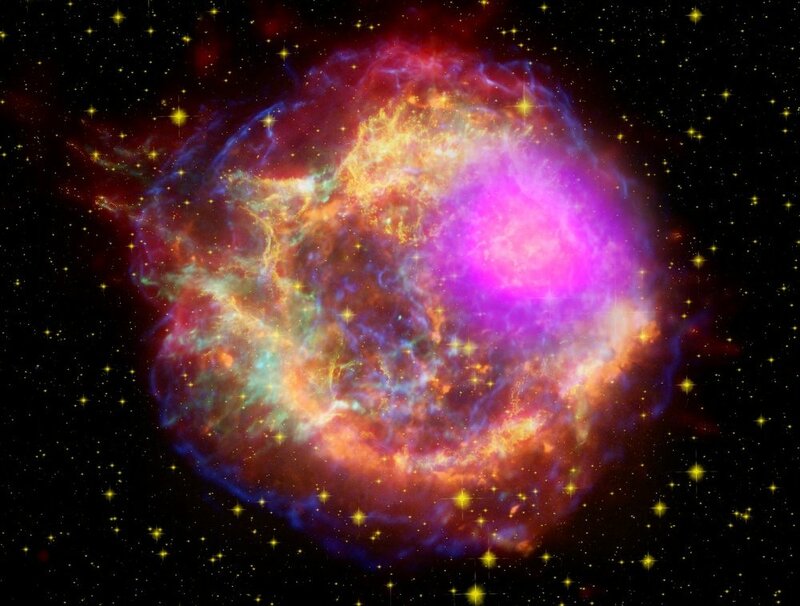 Most probably Cassiopea A has been generated by a supernova event (exploded about 11,000 years ago and that reached the Earth about 300 years ago) from sixth magnitude star 3 Cassiopeiae, that John Flamsteed cataloged by August 16, 1680. 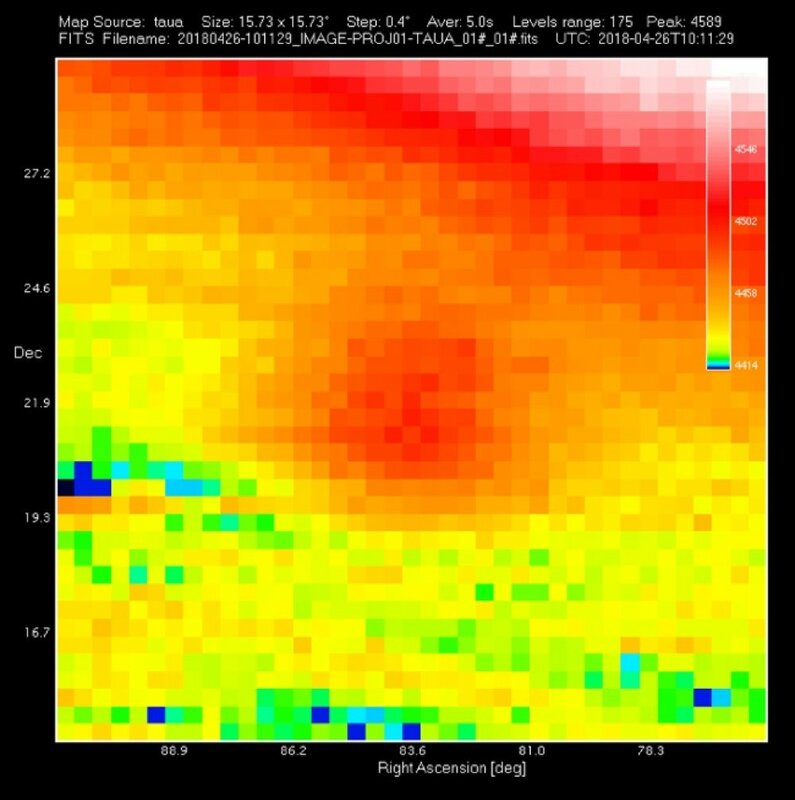 Cassiopeia A .
Cassiopea A across the spectrum: Gamma rays (magenta), X-rays (blue, green), visible light (yellow), infrared (red) and radio (orange). Credits: NASA/DOE/Fermi LAT Collaboration, CXC/SAO/JPL-Caltech/Steward/O. Krause et al., and NRAO/AUI. When we want to record weak radio signals coming from Cassiopea A (this is valid for all the radio sources except for the Sun) we have to be sure that the radio telescope is correctly aimed to the right sky area: in fact we can’t directly see the object we want to study. In order to do so, we took advantage of the high pointing precision of the WP-100 mount of the SPIDER 300A radio telescope and we used the Offset Alignment feature of RadioUniversePRO to perform a precision alignment on the Sun. Since the Sun is the strongest radio source in the sky at 1420 MHz, it’s easy to use it and calibrate the pointing position of the SPIDER radio telescope. The Source Visibilities tab of RadioUniversePRO allows you to check the visibility of many radio sources and we used this feature to verify that Cassiopeia A had a good elevation from the ground. In fact we recommend to study radio sources that are least at 30 degrees from the ground. Then we made a double-click on Cassiopea A row and SPIDER radio telescope automatically pointed at it. 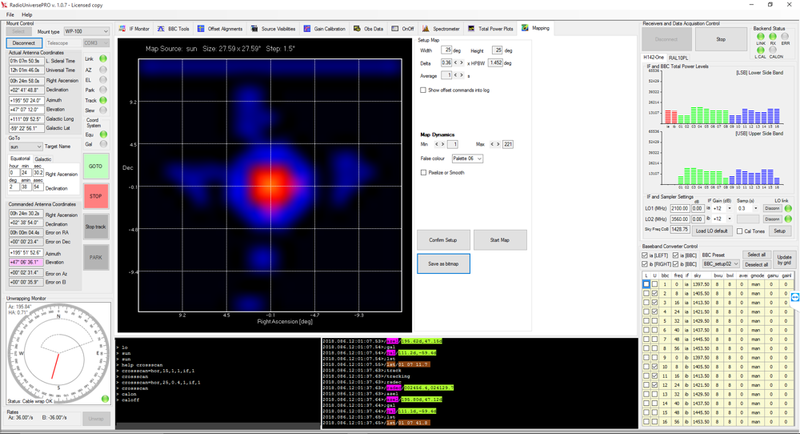 Before starting to record data, we used the BBC Tool feature of RadioUniversePRO to check for interferences in the 50 MHz bandwidth (centered at 1420 MHz) recorded by the SPIDER radio telescope. 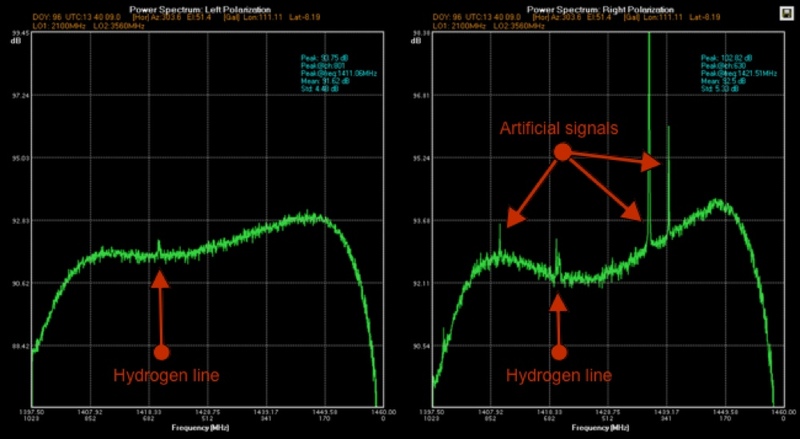 As you can see in the image below, the neutral Hydrogen line (1420 MHz) is clearly visible along with some artificial interferences. By using the BBC Tool feature of RadioUniversePRO we can easily remove the interferences and allow the SPIDER radio telescope to record valid data without artificial radio signals. 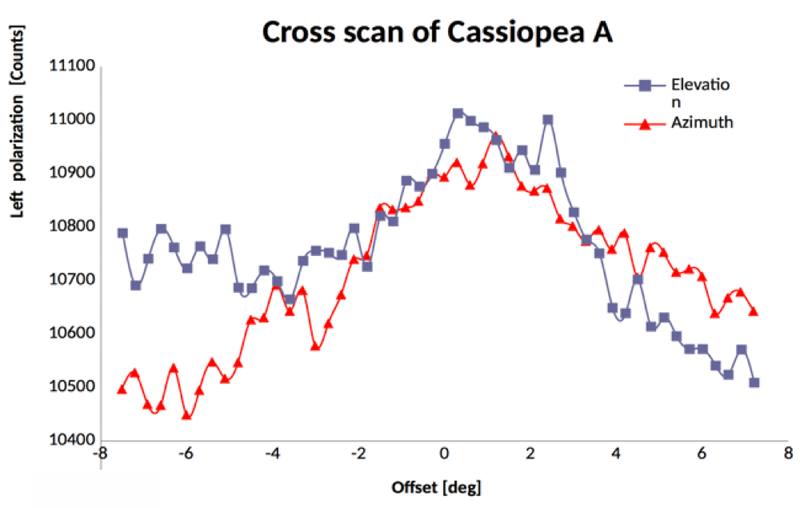 Having correctly pointed the radio telescope and removed interferences, we started recording many results on Cassiopea A. First of all we started capturing a Cross-Scan: this technique involves recording a transit in both Elevation and Azimuth, centered on the object. This way we get a graph of the intensity of the radio emission along a cross centered on the object and that allows to determine the maximum radio emission of Cassiopeia A. In order to perform this operation, we select the “TPI Plot” tab in RadioUniversePRO and we use the Cross-Scan feature. Here you can set the length of the scan, the separation of each record point and the integration time of each record point. 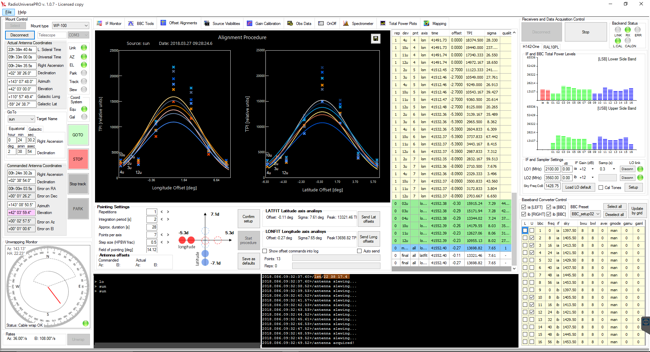 The SPIDER radio telescope mount moves the antenna and the software creates a graph like the one you can see in the image below. RadioUniversePRO saves the data in various formats that can then be processed with different softwares. 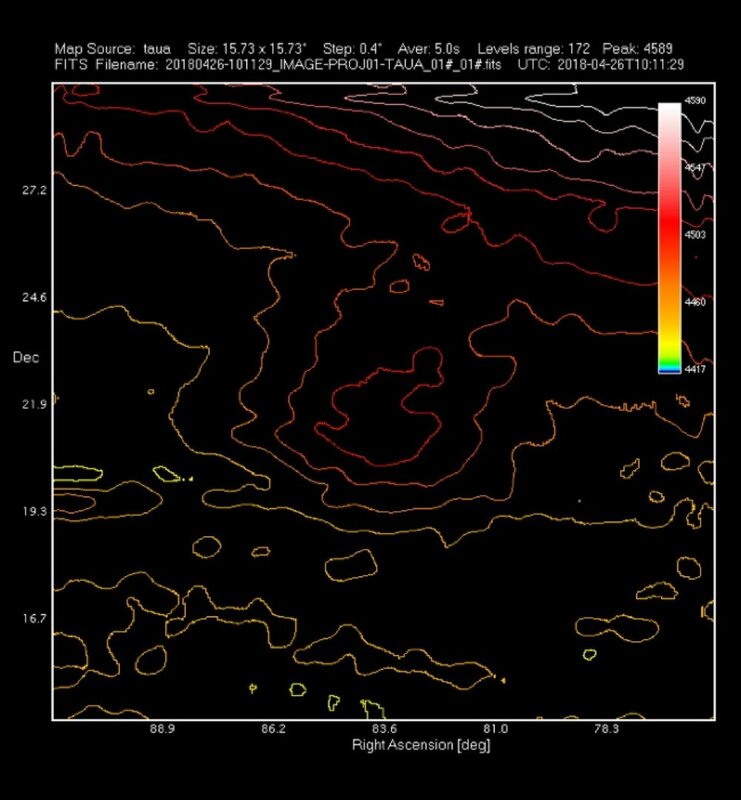 In this case we used a simple editor to generate a graph that shows both transits 15 degrees long with the variation of the radiometric datum recorded both in elevation and azimuth. We clearly noticed the increase in the recorded radio value caused by Cassiopea A. In this way we also verified that the SPIDER radio telescope mount is perfectly aligned on the radio sources in the sky and that Cassiopea A was perfectly framed. 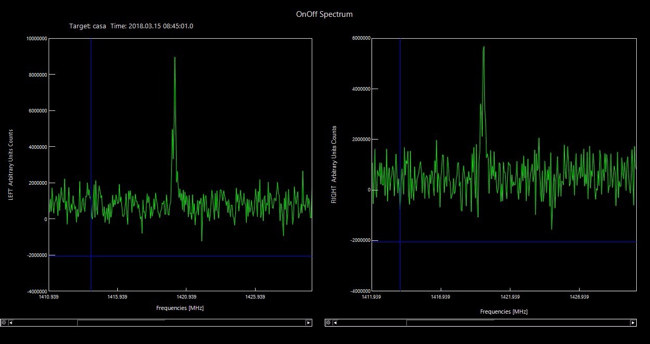 Then, in order to highlight the 1420 MHz neutral Hydrogen emission line, we recorded the Cassiopea A spectrum. 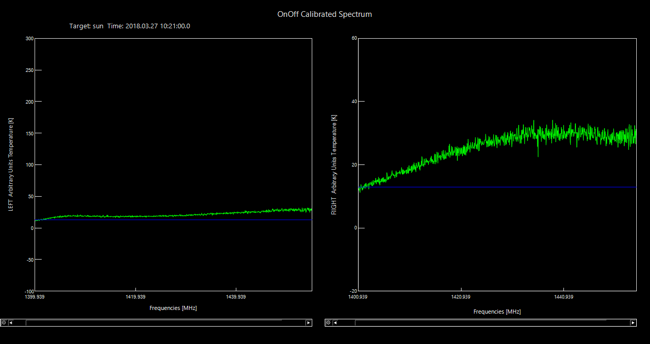 We used the calibrated spectrum On-Off feature of RadioUniversePRO: the software automatically records data from the radio source (“on” position) and then calibrates with a point in the sky away from the radio source (“off” position): the result is a calibrated spectrum as you can see in the image below where the emission of the hydrogen line at 1420 MHz is clearly visible. 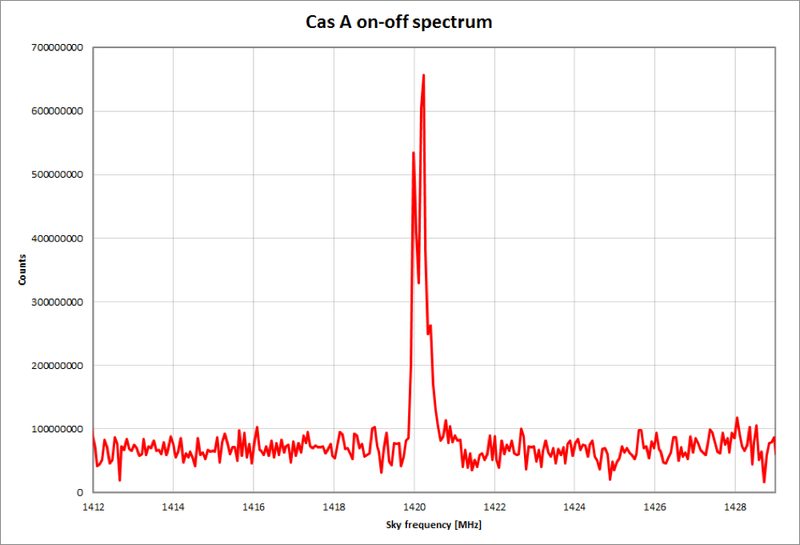 Cassiopea A recorded with SPIDER radio telescope: calibrated spectrum of Cassiopea A with neutral hydrogen line at 1420 MHz. One of the most advanced features of RadioUniversePRO is the Mapping one and we used it to record different radio maps of Cassiopea A, by setting a capture area of 15×15 degrees, with 30 seconds of integration for each point and a separation between the points of 1 degree. By recording different maps we checked the consistency of data: as you can see in the image below, all of them show an increase in the signal right close to the map center, just where we expected to find Cassiopea A. 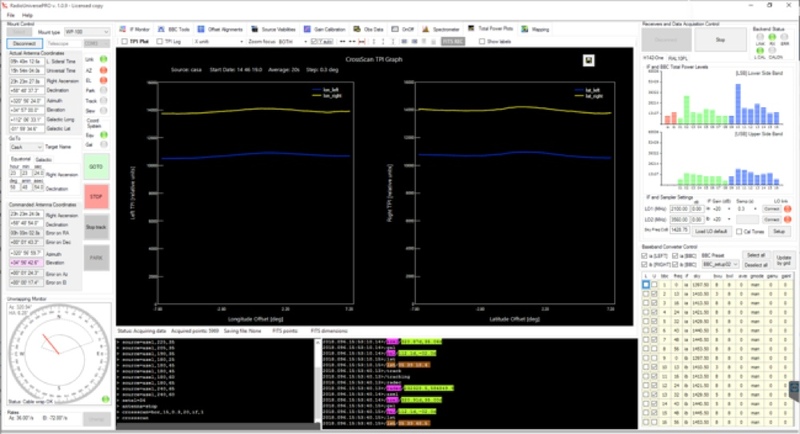 By saving recorded data in FITS format (just like the professional radio telescopes) we extracted the data that can be processed with different softwares. Then we used the NASA FITS Viewer software to process one of the radio maps, better highlighting Cassiopea A signal from the sky background. 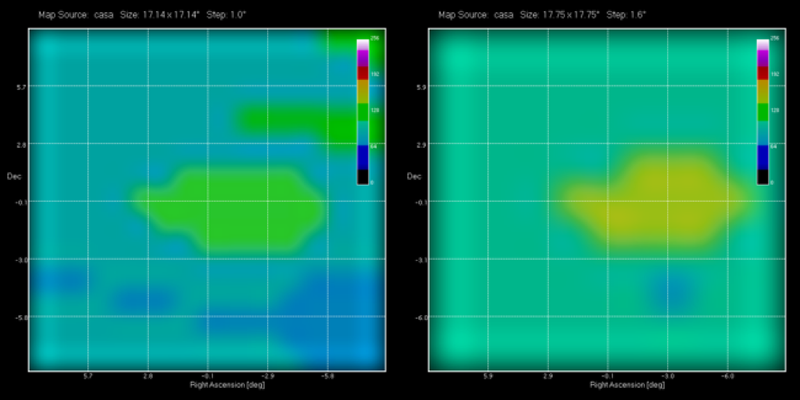 The radio map captured by the SPIDER was then compared to an optical image, as you can see in the image below. It is easy to see how, in an area apparently empty of particular objects, the SPIDER radio telescope instead records an important object, just the supernova remnant known as Cassiopea A in the nomenclature used for radio sources. 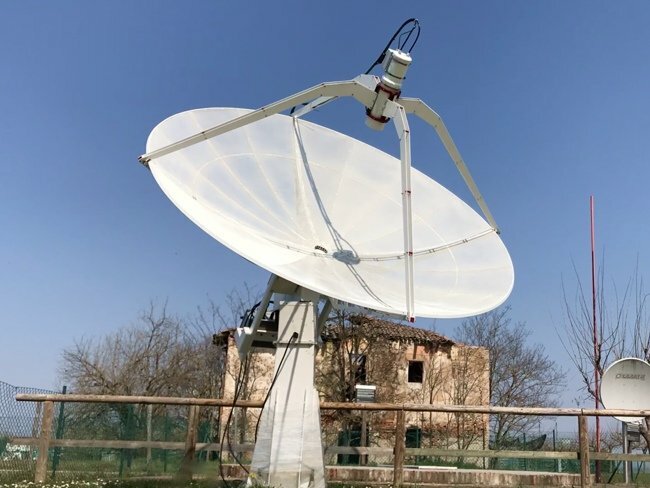 SPIDER is the radio telescope developed and designed by Radio2Space in order to allow everyone to make real radio astronomy without the need of being a radio astronomer! Click here to discover the full line of SPIDER radio telescopes. Taurus A is the radio source in Taurus constellation that corresponds to the Crab Nebula (M1), the supernova remnant exploded on July 4, 1054 and noted by Chinese and Arabian astronomers of the time. Since then, the gas cloud has expanded and today is over 6 light years large. In this article we see how the SPIDER 300A radio telescope “discovered” it by capturing the radio waves emitted by Taurus A and converting them into a radio map, a real photograph in radio waves of this nebula. In fact it is believed that Taurus A emits radio waves for synchrotron radiation caused by electrons in fast spiral motions around magnetic field lines generated by the pulsar inside it. Thanks to the WEB300-5 3 meter diameter antenna and the 1420 MHz H142-One receiver, the SPIDER radio telescope was able to easily record the weak signal and, thanks to the precise mount and pointing system, it generated a radio map with the same technique used by professional radio telescopes. Taurus A recorded with SPIDER 300A radio telescope: SPIDER 300A radio telescope used for this article, in the background the Marcello Ceccarelli Visitor Center in Medicina (Bologna – Italy). With SPIDER, the Sun is so strong we can use it as reference radio source to align the mount on the fly. All the other radio sources are weaker but the high sensitivity of the SPIDER radio telescope allow you to really record them. In order to verify this, we used the SPIDER 300A radio telescope installed in Marcello Ceccarelli visitor center in Medicina (Bologna, Italy – near the professional radio telescopes of INAF) to record a radio map of Taurus A and demonstrating the features of RadioUniversePRO control software that comes with the SPIDER radio telescope. A radio telescope is different from an optical telescope by many aspects: one of these is that it collects radio waves from a single area in the sky. Just to give an example, it’s like having a telescope with a CCD camera that comes with a single large pixel. In order to create radio maps, technique consists in moving the antenna with small movements and, for every sky position, record radio waves coming from space tracking the sky apparent movement. Then the SPIDER antenna is moved to a new position and record the next pixel value. For every pixel, RadioUniversePRO software calculates the total amount of radio waves captured and displays this value with a color based on a color scale chosen by the user. Solar radio emission can be studied by using SPIDER radio telescopes. The Sun is in fact one of the most interesting radio source in the sky. In fact the Sun not only emits visible light but also other frequencies in the electromagnetic spectrum. For example, everyone can feel the Sun heat on our skin, expression of infrared radiation. 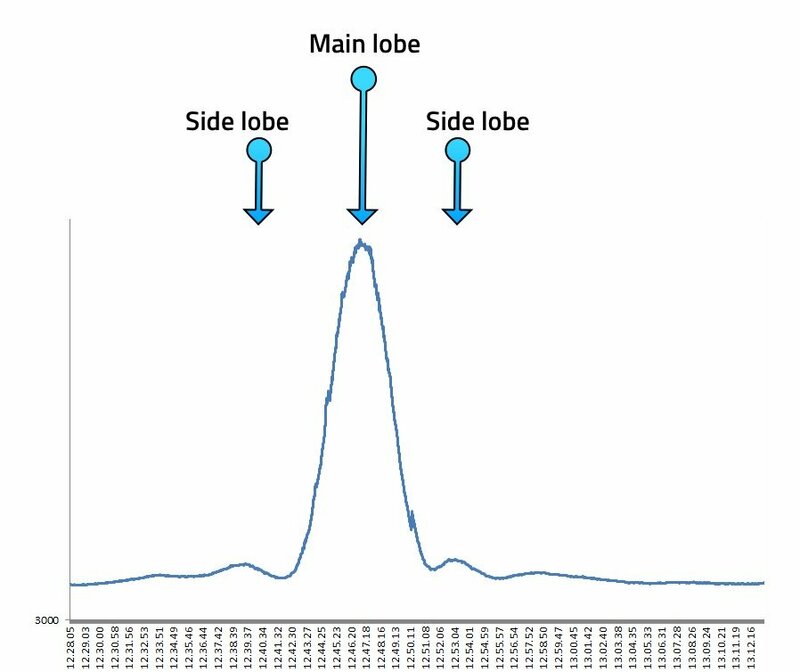 In this article, with step-by-step guide, we see how the SPIDER radio telescopes detect radio waves coming from the Sun and we show how to generate transits, radio images and spectra by using the RadioUniversePRO control software. We perform automatic pointing and tracking on the Sun, detection and removal of eventual artificial signal and capture of different results. The Sun emits radio waves for both thermal mechanisms (due to its high temperature) and for non-thermal (for example synchrotron radiation when the electrons are forced in a spiral motion around magnetic field lines). For wavelengths greater than 1 cm (ie less than about 30 GHz), the solar radio emission is made up of two components: a constant one called “Quiet Sun” due to the heat of our star and a variable one called “Disturbed Sun” that varies over time and depends on the presence of sunspots or flares. SPIDER radio telescopes let you record these emissions. Start RadioUniversePRO software and connect SPIDER’s mount and receiver. 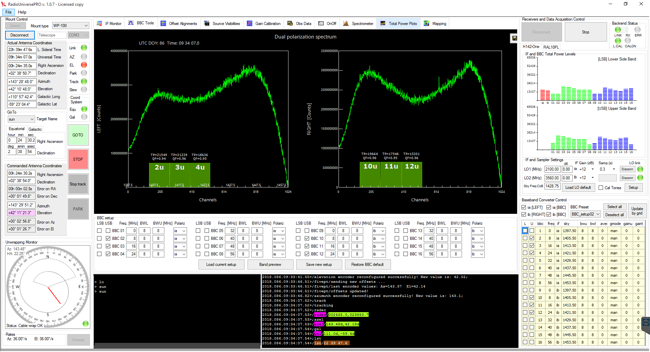 In the IF Monitor tab you will see the radio telescope data in real time, as you can see in the picture below. Now select BBC Tool tab and check for signal quality. 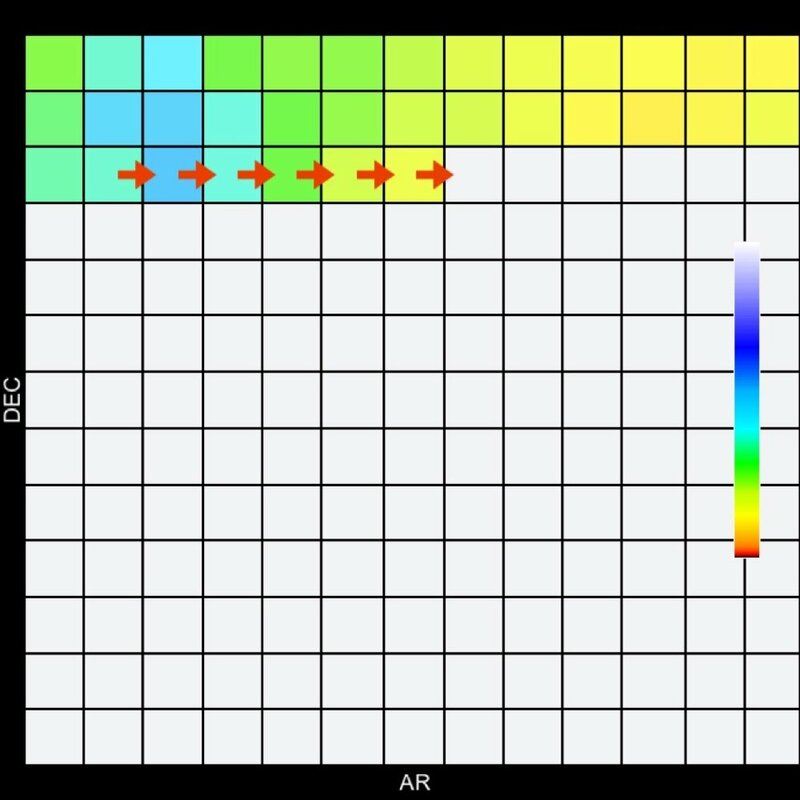 Here you can see if you have interferences caused by artificial signals and easily remove parts of the spectrum, if needed. Please note that interferences caused by artificial signal vary upon your location and the direction pointed by SPIDER radio telescope so you need to check BBC Tools before starting your data recording. Being sure that we’re perfectly aligned on the Sun and that we’re not recording artificial signals, we can now start recording data and producing results. Let’s start with a Cross-Scan of the Sun. This technique consists in moving the radio telescope creating a cross centered on the object and recording radiometric data for every point: this will allow us to determine the maximum radio emission. In order to perform this operation, we select the “TPI Plot” tab in RadioUniversePRO and use the Cross-Scan feature, by selecting the length of the scan, the separation of every recording point and the integration time of every recording point. SPIDER radio telescope mount progressively moves the antenna position and RadioUniversePRO software creates a graph like this one one you can see in the picture below. 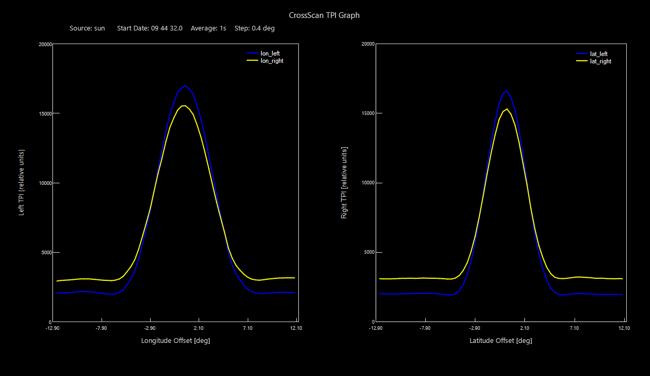 Cross-Scan feature can also be used to calculate radio telescope parameters like the half power beam width (HPBW). Now we produce a radio map, a real image of the Sun recorded in the radio frequencies. We select the “Mapping” tab where we can set all the recording parameters of the radio map. The SPIDER radio telescope will scan the sky area around the Sun, depending on the size of the radio map, the separation and the duration of data capture of each point that compose the map. The map will then be displayed by RadioUniversePRO using one of the different user-selectable color scales. In the image below, the result of the capture of the radio map of the Sun, with an area of 25 degrees of side. The effects of the lateral lobes that form the cross pattern around the central figure of the Sun are also visible. Then we move to Sun spectrum recording, using features of the OnOff tab. The OnOff technique consists of recording data from the radio source (“on” position) then moving the radio telescope away from the radio source (“off” position) and recording other data that are used to calibrate the previous ones, also using the appropriate optional noise calibrator SPIDER radio telescopes. The result is visible in the image below, you can see how, unlike discrete emission objects in which, for example, the SPIDER radio telescope is able to capture the hydrogen line, on the Sun there is a continuous broad spectrum emission. Is it possible radio astronomy at school? In general, the activities that many schools develop in astronomy are usually made ​​with optical telescopes because instruments for other electromagnetic spectrum bands are considered too expensive or difficult to use. This often translates into single evening visits with students at the public observatories, so you can not conduct a continuous study. Thanks to our SPIDER radio telescopes is now really possible to make radio astronomy at school because, unlike an optical telescope, they can also be used during the day and then during normal lesson time! The SPIDER radio telescope is installed outside and it’s remotely controlled for example from the classroom or the laboratory. Anyone with a satellite dish, an LNB and a SatFinder can point and verify that the Sun emits radio waves. Radio2Space has, however, developed a line of complete radio telescopes with the best performance (and therefore more results) and with greater ease of use. 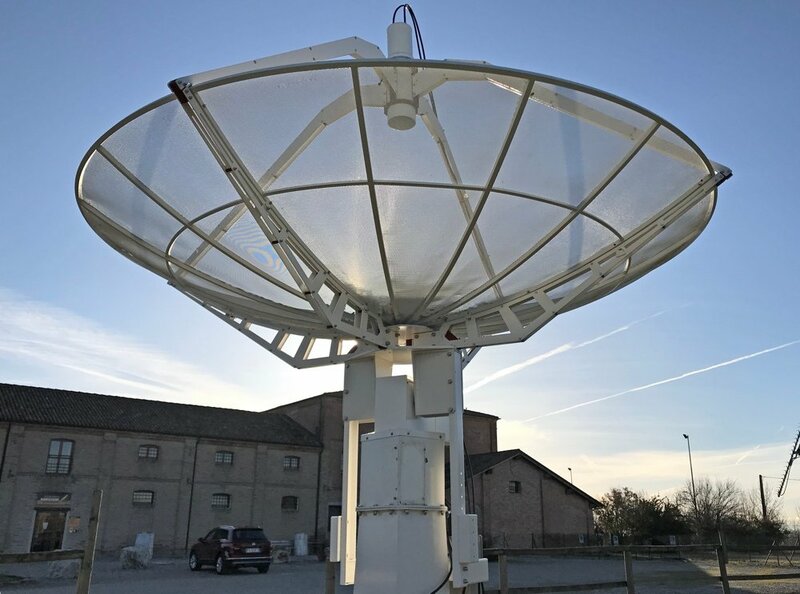 SPIDER radio telescopes, thanks to its great parabolic antenna, precise pointing system, increased stability and sensitivity of H142-One 1420 MHz radio astronomy receiver for 1420 MHz frequency and advanced RadioUniversePRO control software, is able to pick up radio waves from multiple sources in the Universe. Moreover, thanks to the particular control system, they’re easily remotely controlled and then they’re the perfect instruments to make radio astronomy at school. The activities of radio astronomy at school are many and relate both to astronomy and physics. SPIDER radio telescopes in fact let you not only to record radio waves coming from space but also to study how they are generated in the Universe and how they are collected by the instrument itself. It is thus possible to combine the concepts of physics of electromagnetic waves to the ones of astronomical phenomena that generate them. Although it is more compact (but for this at economic reach of many!) then a professional radio telescope, SPIDER radio telescope can be used to demonstrate to students that different objects in the Universe emit not only visible light but also radio waves. By recording data also in the form of transits or radio images, it is then possible to introduce black body concepts then get to the quantum theory, photons and various atomic models. SPIDER allow to point and track radio waves coming from many radio sources, also extra galactic and during daytime. You can then also integrate the physics explaining to students why radio waves penetrate clouds while the visible ones are blocked (or greatly diminished). You can then study the phenomena that explain birth of radio waves from many radio sources and study if or why they are polarized. 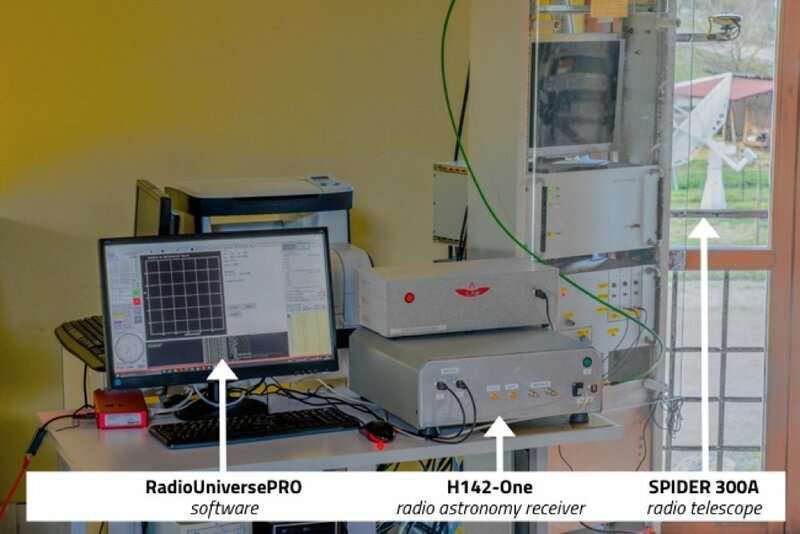 SPIDER radio telescopes come with 1420 MHz receiver developed for radio astronomy: H142-One receiver comes with 1024 channels spectrometer module that allow to record Hydrogen line coming from, example, the Milky Way plane. This way students can study Doppler effect and relative velocities of different parts of the Milky Way. Even objects around us emit radio waves. For example, pointing the radio telescope towards a nearby building, you will notice an increase in the value of radio waves. Comparing this value with the one found by pointing the Sun or the Moon, it will be possible to determine their surface temperature! Thanks to the possibility of calibrating the signal, SPIDER control software lets you to monitor the emission of a radio source for a long time. For example, by focusing to the Sun, you can make one measurement per day for the period of time necessary to its revolution (about 25 days) and then will be able to correlate it with other phenomena such as the number of sunspots visible with an optical telescope (with special filter for protection!). Finally, note that the radio telescope uses a special radio, the radio astronomy receiver, which can be analyzed and used to make students understand the physical phenomena related to the generation and capture of electromagnetic waves. It will be possible to study how an electric current generates an electromagnetic wave and how a parabolic dish allows you to focus and amplify radio waves. These are only just a few examples on how to use SPIDER radio telescopes to develop radio astronomy at school. Is it possible to make amateur radio astronomy? If you already have an equatorial mount (the one used with optical telescopes) with at least 50 kg load capacity and Losmandy dovetail clamp (like an EQ8), thanks to the products developed by Radio2Space, you can turn your telescope into an amateur radio telescope, and start your amateur radio astronomy program without the need to have extensive knowledge of radio techniques. A radio telescope consists of an antenna that collects the incoming waves from space (corresponding to optical tube in an ordinary telescope), a mount that follow objects in the sky (such as the equatorial models that amateur astronomers usually use, but that in professional radio telescopes is usually alt-azimuthal), the receiver that amplifies the radio signal (which corresponds to the CCD camera of an amateur telescope) and the back-end that records and processes data (corresponding to the computer with the software that controls the amateurs telescope and capture images with the camera). A compact radio telescope for amateur radio astronomy: the antenna installed on the equatorial mount. If you own a computerized equatorial mount you already have one of the components of this system, and if this has a weight load capacity of at least 50 kg and Losmandy type dovetail clamp (for example, an EQ8) then you can use our WEB230-5 2.3 meters diameter parabolic antenna. Amateur astronomers are able to use their mount same functions to support the parabolic antenna (as they do for their optical tube) using this system in a similar way to telescopes and without the mount to be modified. The main difference is that there won’t be an eyepiece to bring the eye on to see the image, but the antenna will collect radio waves (with different wavelength than visible) coming from the area of ​​the sky pointed by the mount. For example, you will be able to capture radio waves coming from different objects in the sky, also during daytime, and record also radio maps. Do I have to have advanced knowledge of radio techniques or do I have to be a ham radio in order to use the radio telescope? No, our products are simple to use: all amateur astronomers can use our radio telescopes. All radio components of the instrument are pre-installed and you just have only to press the on button to begin recording radio waves coming from space. When the mount computer is turned on, you normally have to align to the stars. However, by using the mount as a compact radio telescope for amateur radio astronomy, you will no longer see exactly where this point to (stars have a radio wave emission too weak to be detected by an amateur radio telescope). 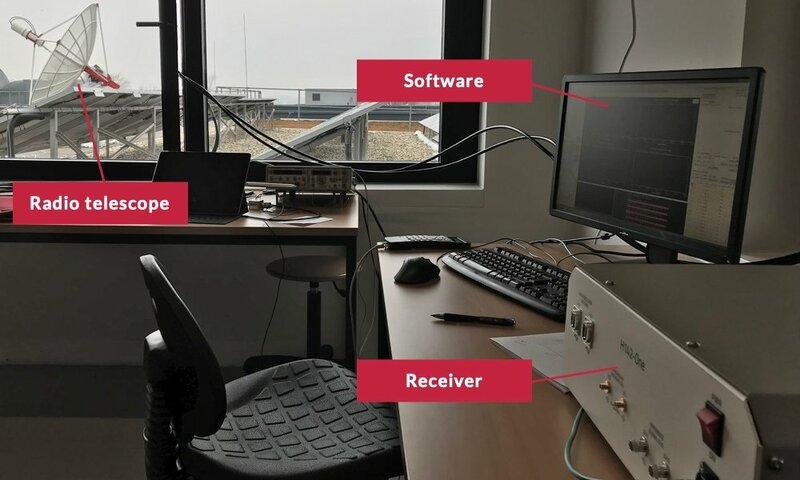 That’s why Radio2Space developed a special technology, integrated in the control software of their radio telescopes, to allow you to directly align on radio sources you can’t see. You have now installed the antenna on the mount and, thanks to WEB230-5 special balancing system, you can use it as a normal optical tube. The radio waves coming from space, however, are very weak and therefore they need to be amplified. This is the task of the H142-One radio astronomy receiver. 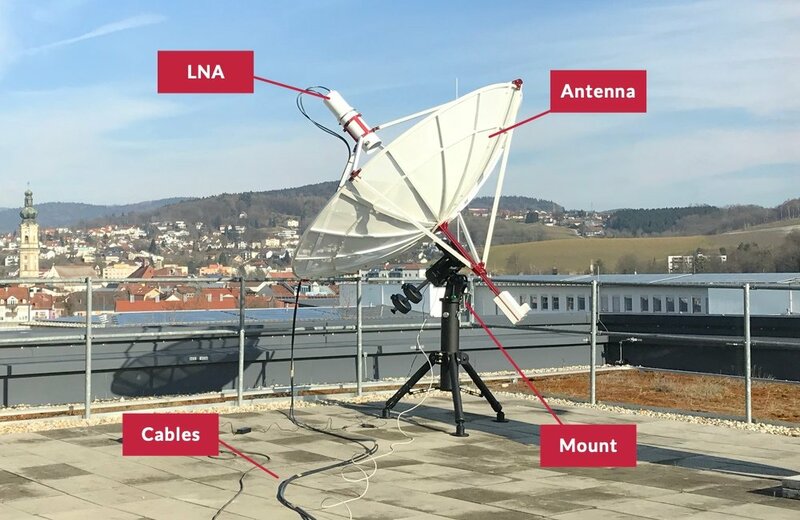 It connects to the LNA low noise amplifier which is installed at the focal point of the parabolic antenna with the H-FEED feed horn that is used to select the reflected waves from the parabolic antenna to the LNA. This sends the collected signal, through a coaxial cable, to the receiver whose task is to amplify it as much as possible and minimizing the system noise. Now you are able to point the antenna to a precise sky area and to record the radio emission. 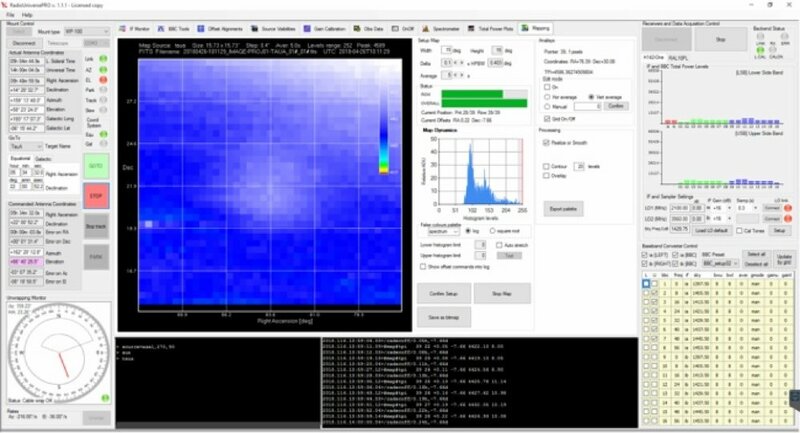 In the same way amateur astronomers are used to record images with their telescopes (astrophotography), our compact radio telescope for amateur radio astronomy, thanks to the special RadioUniversePRO software, allows to record radio waves emission, spectra, transits or radio-images of the area of the sky you want to study in a simple way. This way everyone can start in amateur radio astronomy without having a deep technical or astrophysical knowledge. 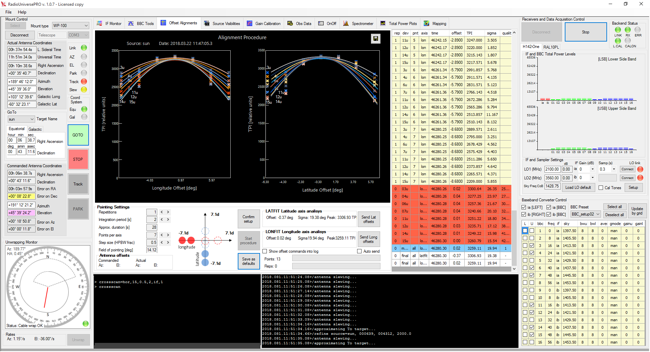 A compact radio telescope for amateur radio astronomy: the RadioUniversePRO software allows you to align on the radio sources you can’t see and record even radio maps of the radio sources. Unlike a normal optical telescope, a radio telescope can be used perfectly even during the day time and, if recording 1420 MHz frequency like in the example above, also in bad weather conditions. But please note that a telescope equatorial mount is not weatherproof. If you want to keep the radio telescope permanently installed in the field, you will have to protect it with a proper structure like a dome. Another possibility you have is to move the radio telescope (since it’s compact), with the help of a few people, when not in use (or when the weather condition is bad). What are the results of radio telescopes? In this article we’ll see some like radio images, transits and numbers. When we record a picture of an Universe object, we usually use a digital camera that has many pixels (typically several millions). This way, when we record the picture, the light we receive “lighten” many pixel at the same time and each pixel records light coming from different sky areas. But, when we use radio telescopes, we record the signal from a single area of the sky (except for professional radio telescopes that may have more LNA units), just as if our camera had only one pixel. If the instrument is equipped with a precise automatic pointing and tracking system, and you have the coordinates of many sky radio sources of the Universe (as in the case of our SPIDER radio telescope), you can point the antenna to the correct direction, and then record the radiation flow coming from the object itself. This expresses the power of the signal emitted by the radio source for frequency unit that passes through a surface of unit area. The type of data obtained depends on the characteristics of the receiver and by the fact that the measure could be calibrated or not. That’s why, in general, the first result you get radio telescopes pointing towards the sky is a number. Results of radio telescope: on the left, radio telescopes record the radio waves coming from a specific area of ​​the sky. On the right, radio telescopes can also record transits of the radio-source to study. Another result type that can be obtained with radio telescopes is a transit. This technique is to identify the object for which you want to record the radio emission, point the telescope in the sky area in which the object will move in the near future (eg 30 minutes later) and stop the telescope in that position. 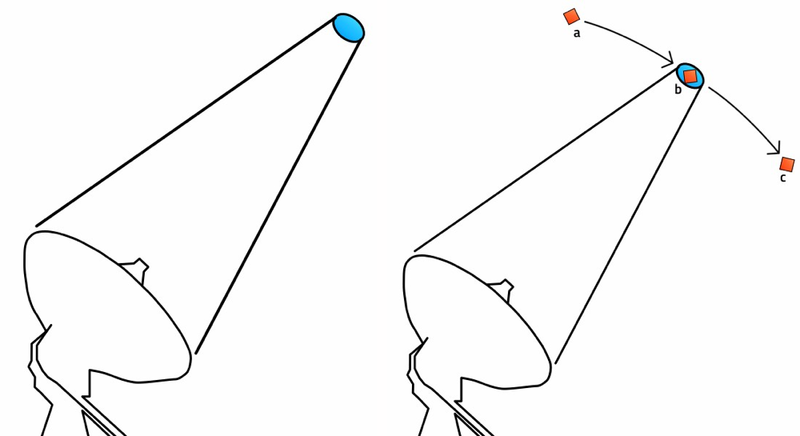 Because of the apparent sky rotation (caused by the rotation of Earth), the object will move towards the area of sky pointed by the antenna (a), there will be (b) and will pass (c). Another way to do this is to move the radio telescope from point a to c with a faster speed than sidereal rate. We can thus record a curve of values ​​whose central bell shows the recording of the radiation flux emitted by the radio source and that is captured by the antenna main lobe. 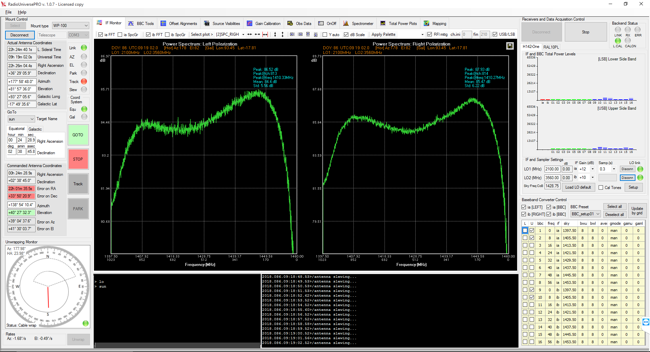 On left and right of the graph, you can see two lower increases in signal due to the secondary lobes of the antenna. This type of result is very interesting since it allows to evaluate other parameters such as the resolution capabilities of the antenna and is also used to verify the performance and working settings (such as focus point). 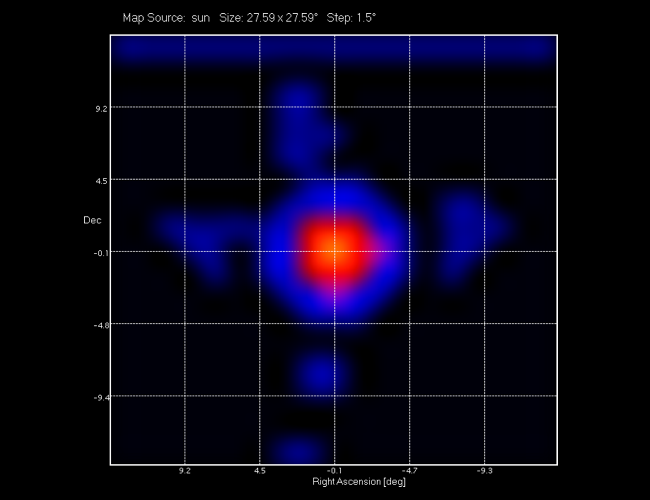 Results of radio telescopes: The transit of the Sun recorded by SPIDER radio telescope. Observe the signal increases due to the passage of the Sun in the main lobe and side lobes. The X axis corresponds to time while the Y (vertical) one corresponds to the intensity of the signal, represented in logarithmic scale to better highlight the secondary lobes. If the radio telescope has a precise tracking and automatic pointing system, we can record a radio image of the object that we want to study. But how can we achieve this if our radio telescope only records one pixel at a time? In order to do so, the radio telescope is moved continuously by scanning the sky area desired and recording, from time to time, the radio emission which comes from each pixel that compose the image. Some pixels will record a different quantity of radio waves from the adjacent ones and this amount is recorded by radio telescope. Therefore, each number is associated with a color: the computer will substitute numbers with colors chosen by generating a radio image of the object again! Our SPIDER radio telescopes allow the user, in a very simple way, to obtain these results with an amateur radio telescope. Whatever you want to accomplish, you can register waves easily using RadioUniversePRO software. In the image below, you can see a radio map of the Sun shown here each pixel has a size of 1.5 degrees. There are also the effects of side lobes (the blue “spots” around the Sun). Results of radio telescopes: radio-Image of the Sun recorded with SPIDER radio telescope. Each pixel corresponds to a numerical value proportional to the intensity of the radio emission coming from a precise sky area.